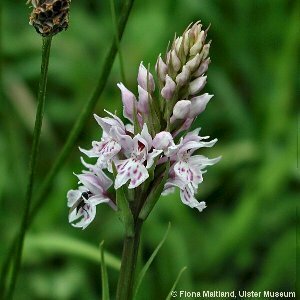 The Common Spotted-Orchid is so-called because it is probably the commonest of the wild orchid species, occurring in a wide variety of situations, but damp pasture and dune-slacks are two of its most characteristic habitats. The leaves are usually, but not always, spotted. 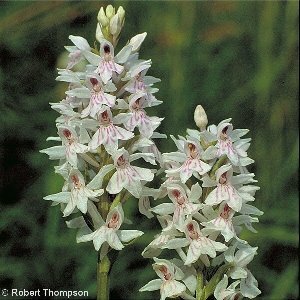 The flowers are produced in dense spikes in the latter half of the summer, and vary enormously in colour from pure white to deep lilac-pink. 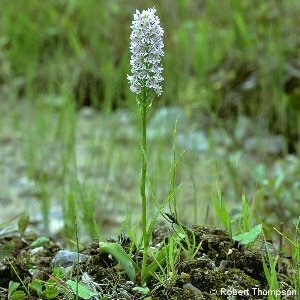 The lower lip of the flower is divided into three more or less equal-sized lobes and is covered by a pattern of dots and lines which is also very variable. 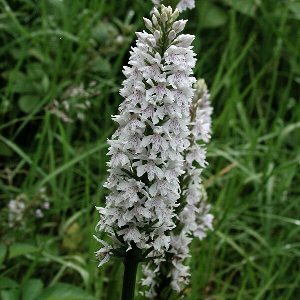 The tubers of this species and other so-called dactylorchids are characteristically divided into finger-like lobes. 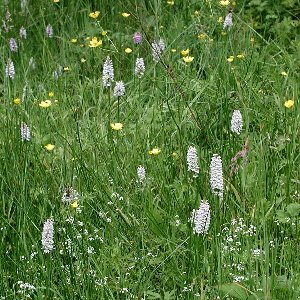 Individual plants appear to be long-lived. 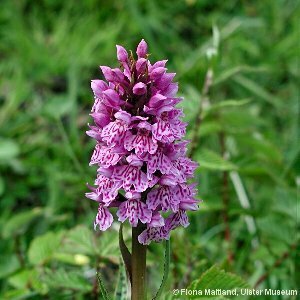 Hybrids with the Heath-spotted Orchid (D. maculata) and Northern Marsh-orchid (Dactylorhiza purpurella) are very frequent, and the species also hybridises with Frog Orchid (Coeloglossum viride) and other species.